Assist your HR team in identifying if there is a problem with current job classifications/values. Ensure that your company has proper job descriptions in order to keep the distribution of labor balanced, create achievable responsibilities for employees, and determine proper market value for each position. Lend a hand in the process of writing new job descriptions through an automated description writer. Assist your HR department in navigating overtime rules, exemptions, and pay ranges. Save time and money by avoiding common job description mistakes. During a recent discussion with a prospective customer, the Human Resources Director stated that her company has doubled the number of employees during the past three years. The company was growing so quickly that the CEO asked the Human Resources Director to find a system that would better manage their compensation process. 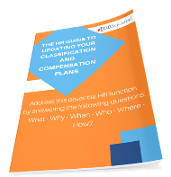 This ebook is your guide to building and refining your Classification and Compensation programs. Learn the What, Where, and Why for building your plans and keeping your company aligned with the talent market. Recently, a large and well-known employee salary aggregator was promoting its market-based pay comparison database and software system as a means for developing reliable pay rates. In the presentation about “developing market-based pay programs,” the company indicated that “internal job alignment” must be combined with market-based pay comparisons in order to create reliable pay rates. DBCompensation, DBDescriptions or View the DBSquared Blog. Follow DBSquared on Facebook, Twitter, and LinkedIn.